Read how other users have used our products worldwide or read about the technical background of our products. Robert L’Eplattenier, test engineer and CEO of Gasenzer AG, often travels “in the field” and is even more often in the Swiss mountains. In February 2015, one job took him literally into the mountains. In the underground pumped storage hydropower station Grimsel II of Oberhasli AG Power Works, a medium-voltage cable in the power derivation of a 100 MVA generator was faulty. The objective of Gasenzer AG from Hinwil while checking an undersea cable in Lake Lucerne in Switzerland was to prevent any potential consequential damage. A transformer in the substation had exploded. It was assumed this had been caused by a damaged cable, as the undersea cable connected to the transformer supplied a dredger and was wound and unwound according to the position of the dredger. 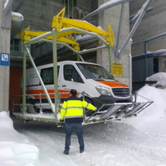 The Gasenzer AG engineer first used the measurement technology of the BAUR cable test van to test the cable insulation before carrying out an echometric analysis. Neither showed any signs of a cable fault. Then a subsequent test conducted using the BAUR viola testing device. The paper summarizes the main fault location techniques that can be used for cable fault location in long submarine cables depending on the various types of faults. It is shown that advanced instruments, detecting techniques and skilled crew are required in order that the detection can be effective in the various cable fault conditions. Measurements performed in field shows that a fault location system especially designed for very long cables can detect faults with a good error accuracy helping in this way to reduce the outage time for repair activities. The hazards for operators and instruments connected to the huge amount of electrical energy that may be stored in very long links are also tackled in the paper (source: © CIGRE 2014). This paper presents the advantages of the application of the combination of offline and online diagnostic tools for underground medium voltage cables. Partial Discharge (PD) online measurement is a useful tool to identify PD activities without the shutdown of a cable circuit. Advantages and challenges of PD online diagnostics combined with the advantages and strengths of offline VLF tan delta and VLF PD measurement are demonstrated by practical case studies. The combination of advanced diagnostic tools allows asset owners to implement condition based maintenance measures most cost and time efficient. Many mains operators in Switzerland and abroad send samples of their transformer insulating oils to ABB Sécheron AG in Dättwil (Switzerland) for testing. While the customer determines the scope of the analysis, it always includes measurement of the breakdown voltage and the dissipation factor. For this, ABB Sécheron relies on devices from BAUR Prüf- und Messtechnik. The use of a VLF sine voltage source opens up the possibility of a single person performing cable testing and diagnostics of a cable route and with portable equipment. In scientific studies and in the field, the VLF sine showed that it is a suitable voltage source for cable testing, PD and tan delta measurement and that the achieved measurement results can be compared with results of tests performed at operating frequency. In addition, the ideal, load-independent sine form proved to be of benefit when it pertains to the reproducibility of results and when load-independence is desired (independence from measurement of cable lengths). Thus, comparisons of measurement results can be performed easily and more experience on condition evaluation of cable routes can continue to be acquired. 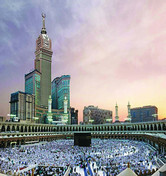 In February 2013, a fault occurred in a three-core 13.8 kV medium-voltage cable in the approximately 600-metre high Mecca Royal Clock Tower Hotel. It was up to the engineers from Advanced Vision in Jeddah (Saudi Arabia) to find and rectify the fault as quickly as possible. They used a BAUR cable test van to locate the fault. Even with ever improving cable technology and broadly adopted diagnostics tools, classic cable fault location applications remain a daily challenge for distribution grid operators. A benchmark study shows that operators face about 8 MV-faults per 1000 km line length every year. New enhancements focus on supporting users and organisations of powerful test equipment better. This means support not only for the specific measuring task but also support during the entire job from assignment to repair and final report. A practical case of winter cable fault location in the Swiss Alps illustrates the practical challenges.